The iPhone is made of aluminosilicate glass. Apple says it's "chemically strengthened to be 20 times stiffer and 30 times harder than plastic" and it's "ultradurable and more scratch resistant than ever." Still not enough to survive a 3.5-foot drop. 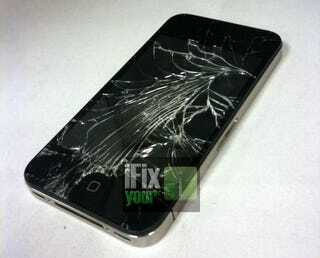 That's what the people at iFixyouri did: Test Apple's claims by dropping the iPhone 4 from 3.5 feet, the distance you drop a phone when you're standing up. They say their iPhone—which they claim is real, but without any internal components—survived the first two shocks. On the third one, however, the display was completely shattered after a loud pop. That's a sound I'm personally familiar with: My current iPhone 3G's display has broken two times in the same way. It's not surprising that the Cupertino company is releasing a protective case of their own called the "bumper". Because now, unlike older iPhones where there's one side that has a display and one side that's plastic or aluminum—where you don't care if it gets messed up or cracked—now both sides are glass. Which means both sides are susceptible to breaking. My iPhone was dropped on its display face two times and broke two times. I lost count on the times it dropped on its back. This new material—20 times stiffer and 30 times harder than plastic—still shatters when dropped. But is it scratch-proof? More scratch-resistant? The test doesn't say. Having both sides be more scratch resistant—the backs of everyone's phones is most likely much more scuffed than the front—is a good thing, if it really is. But having the phone, as a whole, be more likely to break from drops is a bad thing.